Camille Crimson is a pale and curvy redhead who loves riding off-road on her motorbikes. Art is very important in her life, especially playing the piano and the guitare, drawing and painting. Her primal lifestyle gives her the energy and ability to live a happy and rich life filled with adventures. Camille was born and raised in Montreal, Quebec, Canada, and she speaks both French and English. My love and passion for riding my dual bike has no boundary. The feeling is hard to explain to someone who has never ridden, but if you try to remember the feelings of intense joy from when you were a kid, you'll be close enough to what it's like to ride the dirt and the tarmac with the same bike. My idols in the motorcycle world are many, but Chris Birch, Graham Jarvis, and Tom Pages are amongst my favourite. I have a special place in my heart for Tina Meier, who coached me and my friend during the BMW GS Challenge 2013. With her help, we participated in the final event and won the best feminine team! 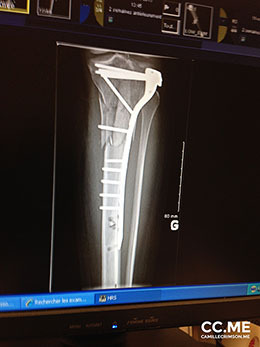 In October 2013, I had a stupid accident where I shattered my tibial plateau. 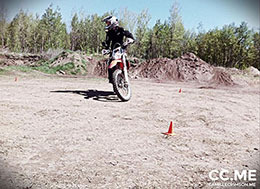 Although physiotherapist and my surgeon thought my leg would never bend at the knee more than 120°, and insisted I would never be able to ride off-road again, I was determined to get back on my bike and in the trails. I worked hard, harder than I have ever worked in my life, both physically and mentally to recover as fast as I could. The results were phenomenal. I rode my bike on and off-road in the spring of 2014, and this summer (2015) I even won a friendly competition where slow-race and mud ridding was involved. I love cooking something tasty and nourishing for myself, but there's nothing better than preparing a meal that the whole family or my friends will enjoy. And because cooking is a form of art, I insist on sharing my favourite masterpieces with the people I love! I'm a Primal/Paleo enthusiast. There's something that rings true to my reasoning about this way of living. It not only sounds right, it feels right in my body. I've tried eating "normal", being a vegetarian, a vegan, and even a raw vegan. To each their own, but for me, it's Primal/Paleo! I've always loved to paint and draw. In my twenties, I dreamed about being an animator so I pulled every ounce of energy out of me and learned to draw the basic human anatomy. Life being what it is, my dream faded with every year passing. I came back recently to my love of drawing and painting, and whenever I get a little bit of free time, I enjoy practicing this hobby, which I intend to eventually do at a more professional level. Who knows, maybe in a few years you'll hang one of my paintings/drawing in your living room! My artistic spirit is multidisciplinary as I enjoy music as much as I do painting and drawing. My favourite instrument to play is the piano, and for my 40th birthday, I finally offered myself an electric piano. I'm learning to read music sheet, but I'm not very good at it. It's much easier to play by ear, and I must admit that I play the guitar much better. I've always been a geek, although we were called nerds back when I was young. Science, math, coding are all disciplines in which I thrive. Although I don't watch much TV anymore and prefer reading, I still revisit classic geeky TV shows like Game of Thrones, X-files, Batlestar Galactica, Star Trek Next Generation and Voyager. I own and operate the site myself. I do everything, from coding to video editing, acting to being the camerawoman, and everything business wise to my social media presence. My site updates every week with content focusing on my passionate explorations of my sexual body.